The very first thing I decided to do after joining this community project was turn to the written past. We had been asked to think about what we might like to work on, research or how we might contribute. I decided to scan the local newspaper, the Kent & Sussex Courier, of 1914, for references to Belgian refugees in the area. Firstly to see if there were any and secondly to isolate themes. Yes, there were references and now I have a file full of themes with columns of text waiting to be dissected. But, unexpectedly the major item which jumped out of the editions I scanned digitally on British Newspaper Archives on-line was not an editorial piece, it was an advertisement. An ephemeral filler, the search function had located the word ‘Belgian’ and provided me with the first challenge to my perception of this project. Figure 1 Kent & Sussex Courier, Advertisement for Weekes Department Store, Friday 27 November 1914, p.4. British Toys for British & Belgian Children. British, French, Belgian, Russian and Indian Soldiers. R.H. Artillery. Boy Scouts and Transport. Naval Landing Parties. 4.7 Guns. All Kinds of Games Dean’s Books and Rag Toys. ‘Meccano’ for model construction, a splendid pastime for Boys. Please enquire about the £200 ‘Meccano’ prize Competition. Tom Smith’s Crackers Lanterns and decorations. An advertisement for Christmas toys is worded ‘British Toys for British & Belgian Children’. A respectable shop advertises its wares. Seasonally marketing products to increase its own profits. By introducing a nationalistic title to ‘children’, defining them as either British or Belgian within the same sentence, both groups them as a collective - ‘children’ and separates them as different from each other within that definition. ‘British Toys for British & Belgian Children’ also promotes home produced items, but by prefixing the child with a country of origin suggests that the child from one country is different to another. Do they need different toys? The advertisement suggests they need: ‘Dolls! Dolls! Dolls! ‘British, French, Belgian, Russian and Indian Soldiers.’ The miniature toys of war, but even they are defined by race. Is this to appeal to the Belgian families to come and buy toys for their children? Or is this an altruistic appeal to the local community to visit the store to buy toys to donate to the refugees who have arrived with very little and are being provided with clothing and homes by local committees, families and the church? Have their children become objects of social curiosity, almost playthings, a counter celebrity status, and the children of war. They become the ‘other’ the outsiders, their needs defined by their place of birth or departure and slightly exotic in their differences. Dolls are not listed by type but toy soldiers are- all from the same side of the war but still distinguished by nationality with no opposition mentioned- no Germans, Turks or Austrians? Here is a postcard of Weekes- with it awnings. Its close proximity to the railway station is also interesting. This station is where many of the refugees arrived in Tunbridge Wells and it is also the main travel artery to London and the coast. Which, significantly, is even mentioned in the advertisement ‘R.W. Weekes Opposite S.E.& C.R. 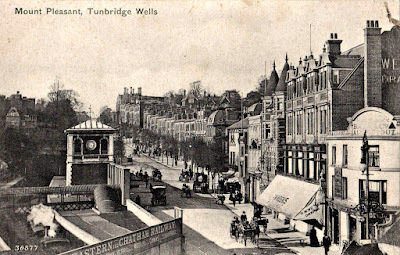 Station, Tunbridge Wells’ therefore it could be suggested positioning itself as a symbol of modernity, movement and connections. It is also important to consider the rest of the page, what is this advertisement placed next to? What is the editorial content of the rest of the page? What other editorials also appear? I would love to know if Tunbridge Wells Museums has a selection of dolls and toy soldiers from this period, plus the other toys mentioned. This could make an interesting small exhibition to run in conjunction with this project. All questions to mull over during the next week.